Grab your favourite suitcase, hat box and picnic blanket, because this month's vintage column is going on holiday. I've found some holiday suggestions that fit perfectly with a vintage lifestyle, whether you're a happy camper or an Art Deco diva. All packed? Let's get on the road. 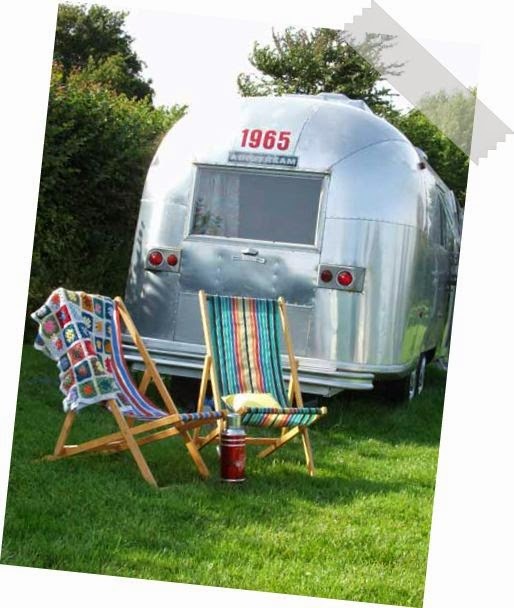 For the most English of holidays, there are plenty of vintage caravans available for hire. Above is Darcy, a 1957 number available for a stay in the Wye Valley, at Mad Dogs and Vintage Vans. It sleeps two and has its original features, plus an abundance of vintage-style florals. There's even a fire pit outside so you can enjoy the great outdoors (of course, for the most English of holidays, you'll need to add rain to that picture). Airbnb have a couple of retro caravan options available too, such as this one in the picturesque Derry and this showman's van in Yorkshire (check out the outside bath!). If you want to venture further afield, you can do le camping in style in Domaine-du-Roc in Brittany. Another vehicle which oozes vintage appeal is the Airstream. 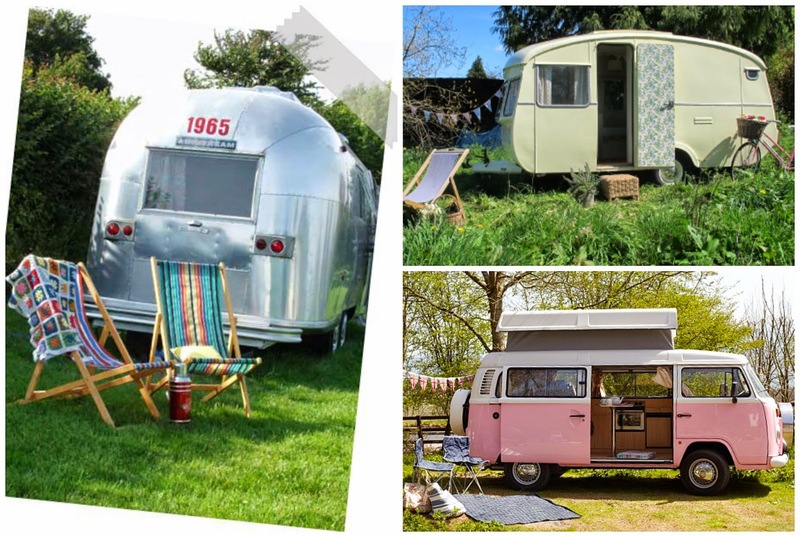 Vintage Vacations are well known for bringing this American classic to the UK, and still offer airstreams for hire on the Isle of Wight. They've also expanded to offer more retro-style self-catering options, such as The Tabernacle - I'm swooning over that kitchen! Brooks Guesthouse in Bristol, meanwhile, have parked their Airstreams on their roof. These models have all mod-cons, including flat screen TVs, so you don't have to suffer for your style. A stay in an Airstream would be an amazing part of a Stateside trip. Here's just a few suggestions, should the fancy take you (and if you go, please take me with you). Lakedale Resort in Washington State has a beautiful backdrop - with with their lodge, you're into proper Twin Peaks territory - while Lazy Desert, in California is owned by Kate Pierson of the B-52s and is as colourful and kitsch as you'd expect an Airstream park owned by a former member of the B-52s to be. Shady Dell, meanwhile, is a 1950s-style trailer park (from back before that came to be a less-than-wonderful thing). To take the show on the row, it's hard not to be charmed by a campervan. 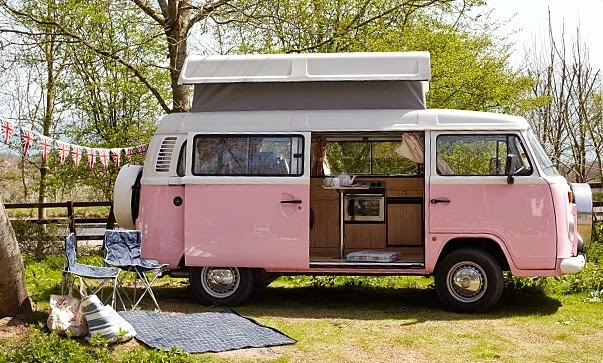 Isle of Wight campers offer a selection for use around the Island, the pretty in pink Penelope is pictured. Or you could always buy your own. Love Lane Caravans used to rent vintage caravans, before they realised they have a business converting them instead. 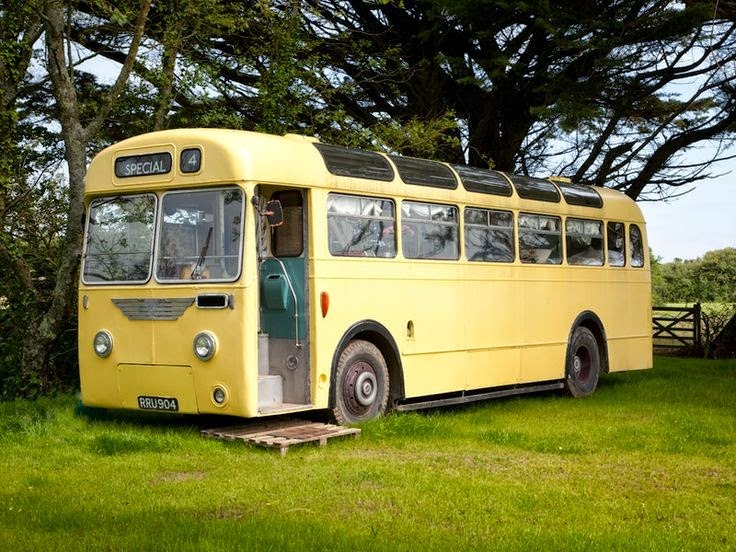 They've got some fantastic models, including the rather special yellow bus pictured above. 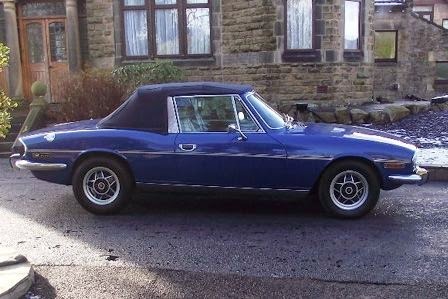 If you prefer to travel light, check out the range of classic cars available through Great Escape Cars, who operate in the Peak District and the Cotswolds. The selection had me swooning and I can't even drive. 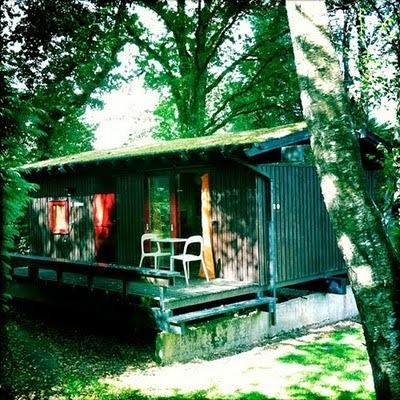 As for vintage self-catering options, we've praised the retro charms of Cabin Casita in south Wales before. For more pine, check out The Wooden House in Aldeburgh, Suffolk, which has been furnished with a fine range of G-Plan furniture and the like. Granny chic goes glam meanwhile in the Cook's Flat, near Fort William. It's always worth searching around Airbnb: this Valletta apartment is possibly my dream home, though I'd happily move straight into this one in Porto as well. If a holiday definitely doesn't involve you cooking your own breakfast, there are some brilliant hotel options too. The above is Betty's Boudoir, part of the rock n roll decor of Brighton's famous Hotel Pelirocco. For more quirky, vintage-influenced style, also take a look at La Rosa in Whitby or Rum Doodle in Windermere. 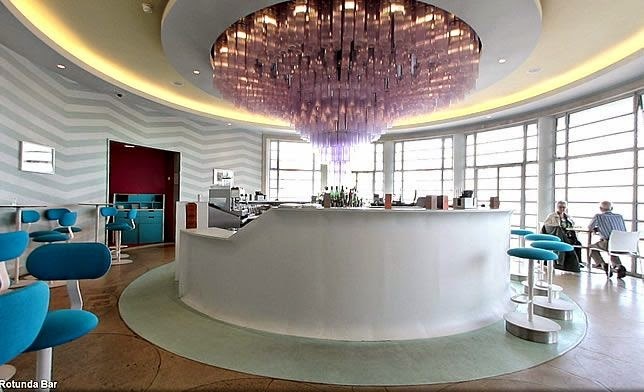 Or you could swoon at the Art Deco splendour of Morecambe's Midland Hotel. It was originally opened in 1933, and given a thorough revamp in 2008. 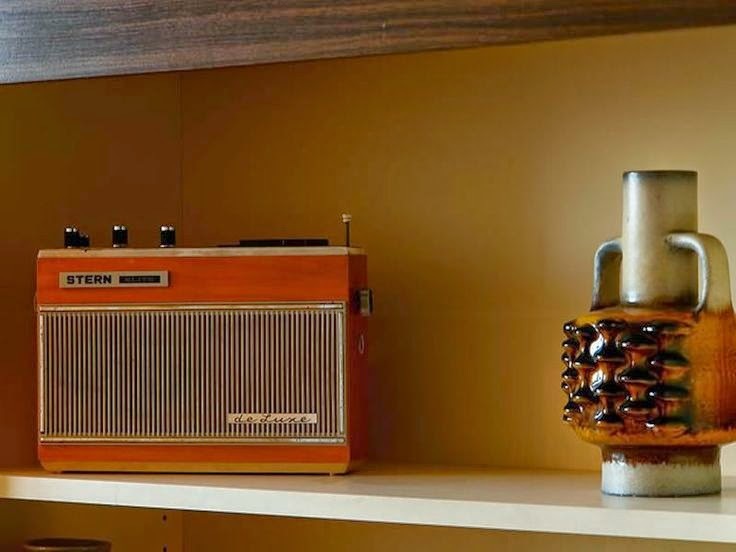 Experience 1960s style, Belgian style in the Vintage Hotel, Brussels. Berlin's Ostel Hotel, meanwhile is a loving reproduction of the East German 'style' of the 1970s and 80s. Fans of pop culture can stay in the Hard Day's Night Hotel in Liverpool. There might be a spot of Beatles memorabilia in there. Or you can find a new place to dwell down the Heartbreak Hotel, near Graceland. Of course you are going to want to stay in one of the four Elvis-themed suites. You might even be brave enough to use the toilet. Finally, for a vintage holiday with like-minded folks, just pick out your best frocks and head to one of the vintage festivals. Twinwood returns on the 23rd to the 26th August to Bedfordshire with all the lindy hop, swing and rock n roll a girl could want. The Goodwood Revival in September isn't a vintage festival as such but guests are definitely encouraged to dress up in clothes from the late 1940s to the mid 1960s - the same period as the vehicles that will be racing. And November's Rhythm Riot offers all the 1950s-style fun you'll need to shake off the winter blues. At least until your next holiday. Oh, let's go on a Campervan road trip. We'll drink lemonade and eat sausage sandwiches. Great post! I stayed at La Rosa campsite near Whitby a few weeks ago for a hen weekend and cannot recommend it highly enough - it was just magical!